Have you ever wondered what happens in a zoo after dark? You might imagine something similar to “Night at the Museum” where all the animals magically come out of their cages and begin their nightly frolics. Believe it or not, this isn’t the case. Many animals, however, are more active after the lights go out than they are during the daytime. Don’t quite believe it? A visit to Reptiland’s annual Flashlight Safari will ease your doubts. Like a giant factory, nature works around the clock. When the animals of the day shift retire for evening, their nocturnal counterparts fill in the same niches at night. For example- think about birds and bats. Whereas you see birds during the day, bats take their place at night. In actuality there are more nocturnal animals, both in sheer numbers and in number of species, than diurnal (active during the day) animals. Clyde Peeling’s Reptiland offers an annual event that allows visitors to see these nocturnal animals up close, viewing the habits that we typically miss. You’ll be amazed by the efficiency of most nocturnal animals. Snakes, for example are among the most efficient nocturnal predators, even thou gh they have poor eyesight. Their excellent sense of smell aids in detecting and tracking prey. Snakes smell with their tongue and some even have heat-sensing organs on either side of the face to detect the distance and location of the prey. Flashlight Safari offers the opportunity to venture through Reptiland’s Exhibit Gallery with nothing but a flashlight to guide you, seeing these incredible creatures at work. You will see mambas, cobras, pythons and rattlesnakes, along with aquatic turtles, poisonous dart frogs, tree monitors and crocodilians. But that’s not all–there will also be opportunities to touch certain animals. . . an American alligator, for one. Also in the lineup for up-close viewing will be Madagascar hissing cockroaches, a tarantula, emperor scorpion, and boa constrictor. After all this, be sure to step outside and explore Dinosaurs Come to Life, our animatronic dinosaur exhibit featuring a dozen species of life-size extinct reptiles. Torches and spotlights will help guide you through this journey where you’ll see a Baryonyx waiting in the swamp, the venom-spitting Dilophosaurus, gentle Brachiousaurus, a nervous Euoplocephalus and of course the two story tall Tyrannosaurus rex! The adventure awaits the next two weekends at Reptiland on Friday and Saturday, October 19th & 26th and 20th & 27th from 6-9pm. 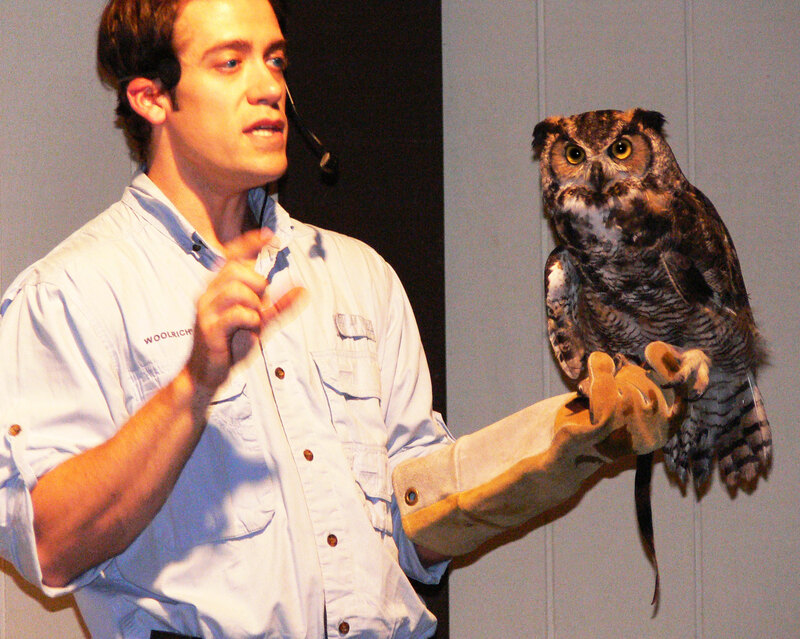 Live nocturnal animal shows featuring a great horned owl, Norway rat, emperor scorpion, giant Indian fruit bat, rattlesnake and more will be presented at 6, 7, and 8pm each night. Groups of 15 or more people that call in advance will qualify for special discounted rates. So, leave the ghosts and goblins for another time, and this year go on a Flashlight Safari at Clyde Peeling’s Reptiland for an unforgettable experience! Baryonyx was a 30 foot long, 3,700 pound dinosaur that lived during the Cretaceous period, approximately 130-125 million years ago. It was one of the few known piscivorous (fish eating) species and was equipped with special adaptations; long, narrow jaws filled with 128 finely serrated teeth and hook-like claws to hunt its prey. Baryonyx hunted much like a modern day grizzly bear, sitting on the banks of rivers or wading in shallow waters, waiting for fish to swim past. It may have even used its hooked thumbs to spear fish from the water. Its habitat consisted of subtropical river deltas and beaches. 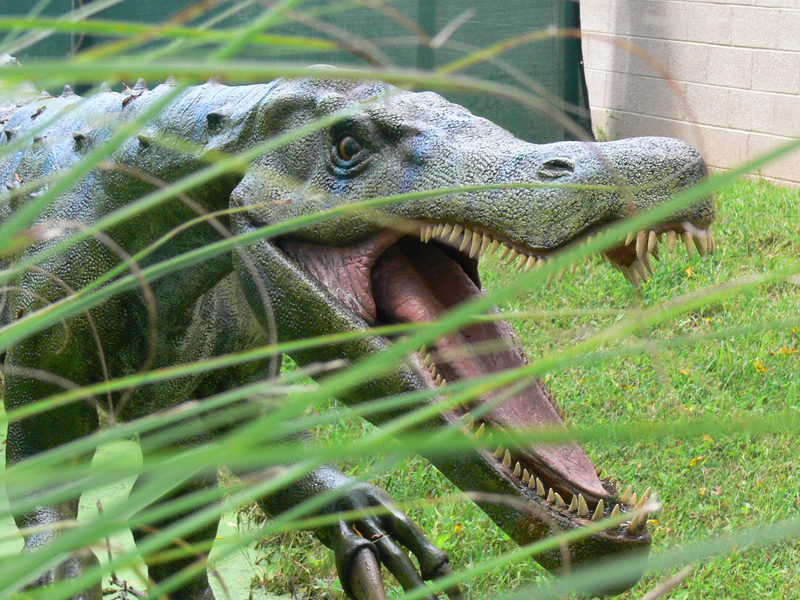 Although likely solitary animals, Baryonyx may have hunted in packs. You can find an animatronic Baryonyx lurking in the waterways of Reptiland until the end of October. Baryonyx is one of the first dinosaurs you’ll encounter in our Dinosaurs Come to Life exhibit, followed by more than 10 other dinosaurs from the Cretaceous and Jurassic eras. The zoo is open daily from 10-5 on weekdays and 10-6 on weekends (note: hours vary based on season). 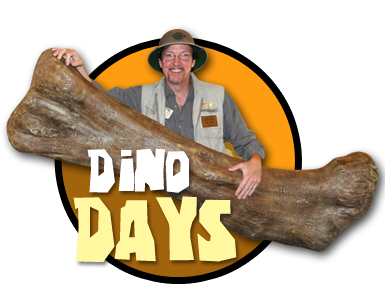 Dinosaurs Come to Life will also be highlighted again this year during our annual Halloween event, Flashlight Safari, which takes place the last two weekends in October, and is your only chance to see the zoo after dark.